Ignacio De La Fuente has served as International Vice President of Area 3 of the Glass, Molders, Pottery Workers Union, since 1983, when he was named by International President James E. Rankin. He also serves as the President of the City Council in Oakland, California. He and his wife, Elvia, have one son, one daughter and one grandchild. In 1971, at age 21, he arrived in California from Mexico City on a tourist visa, broke and unable to speak English. One week later he met Elvia, his US-born wife-to-be, whom he married after a three-month courtship — a bond that made him eligible for citizenship. Ignacio De La Fuente entered the trade in 1973 at Macaulay Foundry in Berkeley California, and served on the Local 164B (Oakland CA) Executive Board from 1996 to 1997. He was elected Business Manager for Local 164B from 1978 until July 1987, when he was hired as an International Representative. He attended the West Virginia Molders Institute and the Wisconsin University Molders Institute. Ignacio has served as a delegate to the Alameda County Central Labor Council for sixteen years and Executive Board Member for eight years. He is a member of the Oakland Housing Authority, the Alameda County Economic Development Advisory Board, Board of Directors of La Raza Labor Institute, San Francisco CA and a member of the Joint Powers Authority for the Alameda County Colisium. 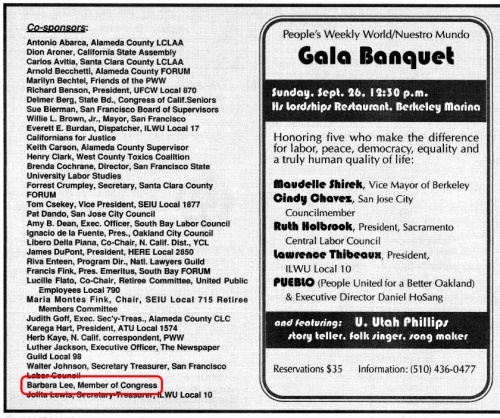 On July 14-16 (probably 1984) The Coalition for a People's Convention "a broad grouping in the Bay Area", organized The People's Convention in order to "unite on and present a people's program to the DNC and to network the many local efforts to win people's power from around the country. Its purpose is to enhance local efforts and amplify them into a united voice and demonstration for reorienting our society away from military aggression and towards meeting the needs of all our people". Endorsers from the San Francisco-Bay Area included Ignacio De La Fuente Business Representative, Molders Union Local 164 Oakland. Eight hundred people filled the ballroom of the Hyatt regency Embarcadero Hotel, Sunday April 28, 1991 to greet South African Communist Party leader Chris Hani. the crowd contributed more than $12,000 towards the People's Weekly World fund drive and the work of the South African Communist Party. Hani was greeted with resolutions of support from Assembly speaker Willie Brown, San Francisco mayor Art Agnos, Oakland mayor Elihu Harris, Richmond mayor George Livingston, Berkeley mayor Loni Hancock, and Doris Ward, chair of the San Francisco board of Supervisors. Co-chairs of the banquet were were Angela Davis and Ignacio de la Fuente of the Moulders Union. Davis, introducing Hani said he "symbolizes a courageous, unrelenting struggle for freedom". In 1992 Ignacio De La Fuente, California, International representative, Glass, Molders, Pottery Workers, Oakland, endorsed the Committees of Correspondence national conference Conference on Perspectives for Democracy and Socialism in the 90s held at Berkeley California July 17-19. This page was last modified on 26 December 2015, at 17:14.